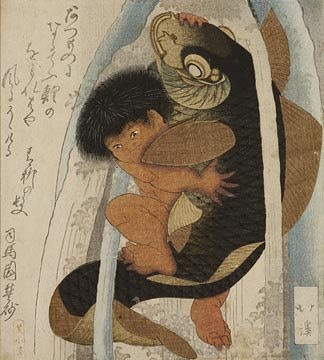 "Kintaro and Carp in a Waterfall," created ca. 1820 by Japanese artist Totoya Hokkei. The carp climbing a waterfall represents development and success, and the boy, Kintaro, in hanging on, is fighting for growth. New glasses...the world spins a bit. But tons sharper with my screen and reading. Maybe now I can see what I am drawing. Maybe? Spent the better part of the morning watching the eighth grade prize ceremony for 125 kids. Very exciting. Thank goodness that the humidity and heat were mild. Then, back to the drawing board. Slugging it out with the Baker Institute book. Please, lets hope we get this finished up. Surimono, which can be translated as "printed thing," were privately produced, limited-edition prints commissioned by poetry groups to be distributed among friends for special occasions, often for the lunar New Year. The artwork and poetry on the prints were the result of unique collaborations among poets, artists, calligraphers and printers. Clever integrations of text and image were combined with the most advanced printing techniques available to produce deluxe presentation sheets for a sophisticated and highly literate audience.There are a range of images from portraits to stil lifes to landscapes. Some of the poems are introspective and a few very cute and fun. Some prints have one poem and some as many as four. So from a design standpoint one has text, headline, image tombstone copy, japanese poem and the translation, sometimes notes. So there is a real typographic hierarchy that needs to be set up to get the layout right. A multi layer grid works...many columns over single columns. A variety of type treatments to match the hierachy of content. Big puzzle will be to find a font that has Hepburn Romanji punctuations/marks. We have been using the international keyboard here on the world of macs, and seeing which fonts can work.